This is a Karakuchi sake, which means it is dry. This elegant sake has citrus and almond aromas with a silky mouthfeel. It can be served chilled, at room temperature, or warm. 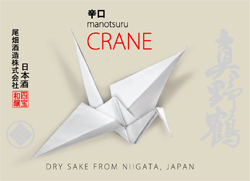 Manotsuru Crane Karakuchi goes well with a wide range of food; try it with your favorite chicken dish!